Those interested in the development of scientific theory and in the nature of academic life will appreciate this intellectual autobiography written by one of America's leading sociologists. Following his family tradition (The Education of Henry Adams was written by his great-uncle), George Caspar Homans describes how his ideas about the proper nature of theory in social science, both in form and content, have developed over time. The chief interest of the book lies in the description of this process. Homans' career has spanned many of the key periods of development in social research, and his own work has been central to the process. He was the first major sociologist to outline the sociological implications of psychologists' work on learning or behavior theory. His contributions to modern sociology have had a major impact on the study of small groups, the problem of theory and methods of theory construction, and the study of basic characteristics of social behavior. He is regarded as the father of social exchange theory. 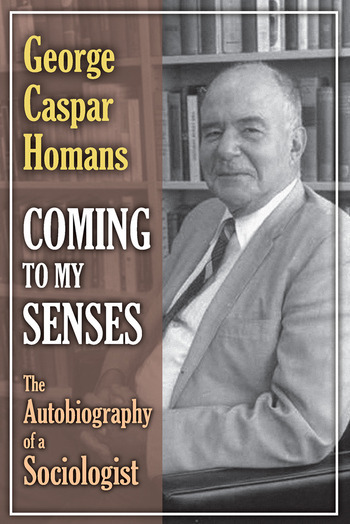 Homans considers academic and intellectual as well as nonacademic influences on his development: personalities of highly idiosyncratic individuals against whose views of culturalism, functionalism, and structuralism he reacted, discussions with colleagues, reading, as well as his ancestry, his childhood in Boston, his literary education and later social-life in Boston, and his experiences as a sea captain in the Navy in World War II. This is an absorbing book, both an autobiography and a history of the development of the social sciences in the post World War II era.